The scavenger hunt is the ultimate bachelorette party game. The bride-to-be and her closest friends will have a blast trying to complete the scavenger hunt before the end of the night. There are numerous types of scavenger hunts you can set up but the rules are all the same. With a checklist in hand, you must complete the items on the list. Your group can work individually or as a group to make it a little more fun. 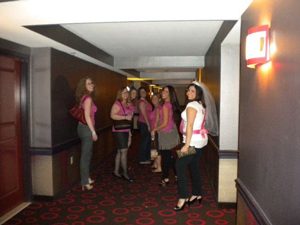 Here’s a look at some sample scavenger hunt checklists for your upcoming Vegas bachelorette party. Take a picture with a random stranger and post it to your Instagram account. Take a picture of your group each taking a shot. Take a picture with a musician or DJ. Take a picture of you dancing on a table. Take a picture of a bartender pouring a drink. Listen to the bride’s wedding song. Find a building painted the same colors as the bride’s wedding colors. Take a selfie with a bridesmaid. Locate the type of flower used in the bride’s bouquet. Find a guy with the same first name as the groom. Go on a hot-air balloon ride. Get a thrill from the Stratosphere ride located at the Stratosphere Casino, Hotel & Tower. Hike in the Red Rock Canyon. Hop in a dune buggy for an off-road adventure. Go zip-lining in Bootleg Canyon. Get a guy’s phone number. Get a free drink from the bartender. Ask a guy to give the bride a lap dance. To enter this hotel, you must walk under a massive lion. This restaurant serves ice cream sundaes priced at $1,000. This statue is about half the size of the famous one in New York. At night, you’ll see a light shining from the top of this hotel. Unscramble this hotel name and take a selfie in front of it: MRTPU. Buy a pair of men’s underwear. Buy his and hers pillows. Buy a bouquet of flowers. 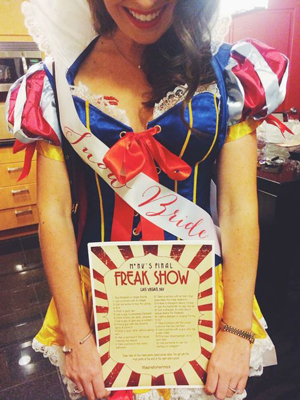 If you’re going to Las Vegas for a bachelorette party, consider making it even more fun with a scavenger hunt. Following a wild bachelorette party checklist is sure to give you and your friends plenty of laughs. Give each girl her own checklist and a number of tasks to complete over the course of the night or the entire weekend. It doesn’t matter who wins or loses as long as everyone has fun.